This past Friday, I came home from work, and I don't think I ever felt so overwhelmed by my house and everything really. I felt like I had left everything go for a while, and all the sudden, I wanted to clean until everything was spotless. I cleaned the kitchen for an hour. Made dinner. 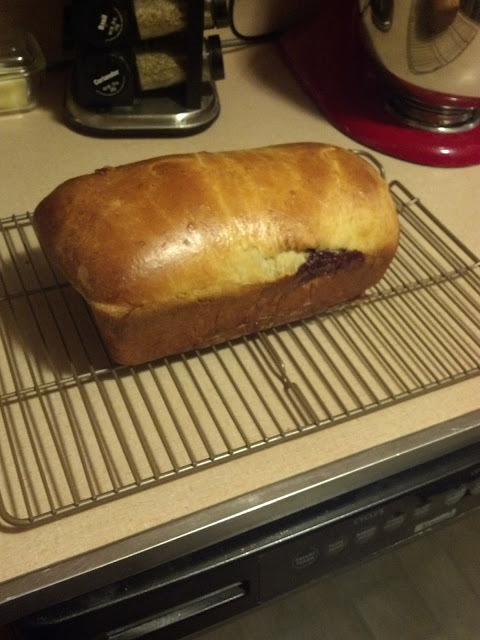 Then proceeded to make cinnamon bread (recipe from the Pioneer Woman's site), and that was great. I was still overwhelmed, and I probably wasn't the most fun to be around at all. When Saturday rolled around, all I could think about was the mound of dirty clothing behind our bedroom door that I hadn't touched in a week and the closets that I hadn't organized in a while. I didn't touch any of that until we came home from lunch at a local winery where I got a headache from drinking a glass of wine. We stopped over at my mom's afterwards, and she was organizing a spare room in her house that she is planning on repainting. Granted, she was only tackling one project at a time. I should have followed her example. Ha! I feel like such an A-type personality admitting this, but once I unleashed my need to clean everything, I felt like I couldn't stop. Bill went to watch the football game with his brother-in-law, and I stayed home watching Nashville and folding an undisclosed number of clean loads of laundry. I can't say I had a very relaxed weekend at all, but I learned something. I can't leave every cleaning project for the weekend. Those projects really destroy my time off. I need to learn how to relax on the weekends. Any tips that you want to give me? That time I chose to eat breakfast food. Things that are making me incredibly happy.